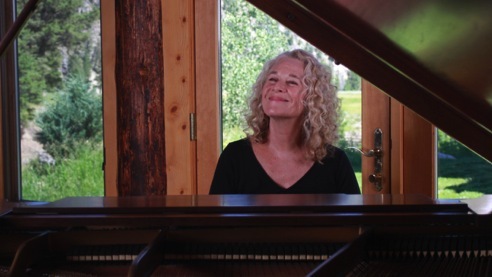 At this point, the life and times of Carole King might seem a little played out from a public recognition standpoint. Summations of her exemplary singer/songwriter career have been bountiful in recent years. In 2013 she became the first woman to receive the prestigious Gershwin Prize For Popular Song. PBS televised the ceremony, with President Obama as presenter. Late last year, King joined the latest batch of Kennedy Center honorees, with a short biographical film included in the annual CBS telecast. Beautiful: The Carole King Musical remains a big Broadway hit in the mold of The Four Seasons’ saga in Jersey Boys. In that context, PBS’ American Masters series is more than a bit late to the party with its one-hour Carole King: Natural Woman. Even so, this is a very entertaining jaunt replete with striking vintage footage and photos (imagine Paul Simon with a thick shock of hair), plus the sheer strength of the musical catalog authored by King on her own and earlier in a storied collaboration with husband Gerry Goffin. It premieres on Friday, Feb. 19th at 8 p.m. on KERA13 locally. “You’ve Got a Friend” has emerged as her anthem after first being heard on King’s breakthrough 1971 solo album Tapestry. But there’s so much more, much of it from the days when she wrote the melodies and Goffin penned the lyrics for songs that became big hits for others. “Will You Love Me Tomorrow” by The Shirelles. “Up on the Roof” by The Drifters. “One Fine Day” by The Chiffons. “Pleasant Valley Sunday” by The Monkees. “I’m Into Something Good” by Herman’s Hermits. “The Loco-Motion” by Little Eva. “Take Good Care of My Baby” by Bobby Vee. And of course, “(You Make Me Feel Like) A Natural Woman” by Aretha Franklin. That’s just naming a few. King, who now mostly lives in Idaho, also recalls the thrill of having The Beatles cover “Chains” after Little Eva’s backup singers, “The Cookies,” had a top 20 hit with it. King was pregnant and both were teenagers when she married Goffin in 1959. They divorced a decade later after his infidelities piled up. Natural Woman makes no further mention of what became of Goffin, who died in 2014. But he managed to write a few more hits without King, including “Saving All My Love For You,” recorded by Whitney Houston. Competing with the King-Goffin team were Barry Mann and Cynthia Weil, both of whom are interviewed for the American Masters film. Mann says they were all close friends behind the scenes, but foes in the cutthroat music business. Both duos aimed to have the next big hit, and they often churned them out on literally a day’s notice. King recorded Tapestry shortly after moving to Los Angeles and becoming close pals with James Taylor. “We had a common mind, you know,” he says of their collaborations. King credits Taylor with encouraging her to perform in public. Her coming out party was at Doug Weston’s Troubadour, where the so-called “singer-songwriter movement” of the 1970s blossomed in full. Some of the best moments in Natural Woman are from an earlier interview with an expansive, considerably younger King. She’s at the piano and appears to be fully at ease whether talking about her music or playing it. The songs have never stopped resonating while King, 74, basks in the afterglow of major awards and tributes. The American Masters film is more icing on her cake. And as it turns out, it’s still not too late, baby.